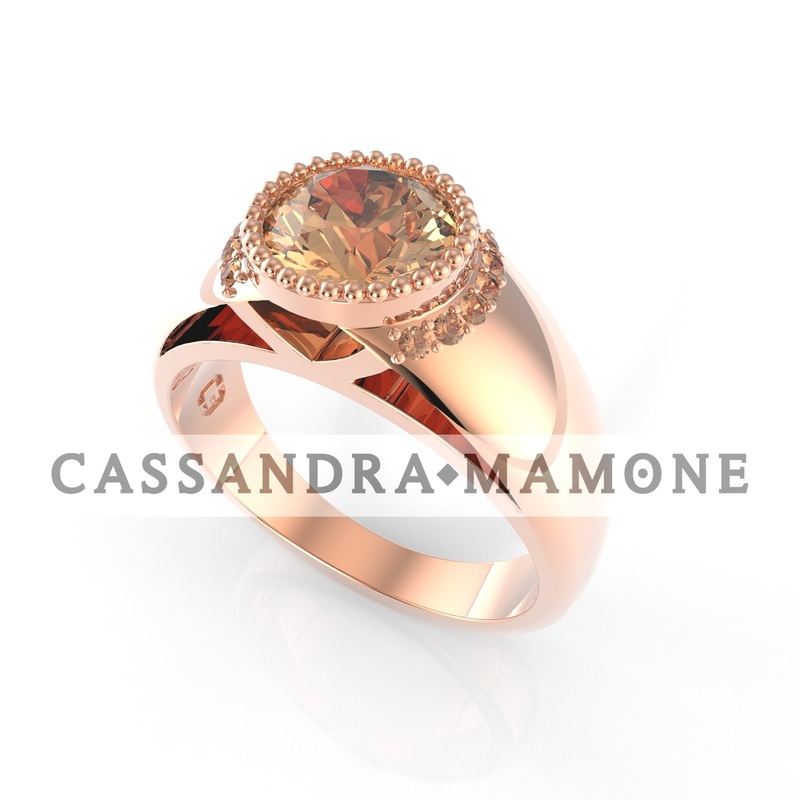 Cassandra Mamone: Thinking about popping the question? Knowing what engagement ring to opt for can be slightly daunting... after all this special piece is worn for a lifetime- so it's worth taking the time to get the right one. So what exactly is the right one? How do the fella's go about getting the perfect style to pop the question with? Adelaide fine jewellery designer Cassandra Mamone asks the questions to help you through the process and ensure the journey is as easy and exciting as possible. Upon your initial consultation with Cassandra you'll be asked various questions like what metal you would like? eg. platinum, 18ct white or rose gold. Diamond shape? eg. brilliant, pear or oval. etc. Platinum being the rarest and most durable metal is fast becoming the most popular choice for engagement and wedding bands. With new trends coming through and women seeking more unique designs- 18ct rose gold is quickly becoming a favourite. Diamonds are traditionally the choice for stone with engagement rings, sapphire's, rubies and emeralds follow closely behind as they have strong and durable properties and can be just as hard wearing as diamonds. Due to it's unmatched strength and purity, the diamond is symbolic of the love declared between the couple. Brilliant cut (round) diamonds are the most popular shape for diamond engagement rings, other shapes include emerald cut, pear, princess, oval etc. Click selection for further info. Many engagement rings feature the centre (larger) diamond set with smaller diamonds around it. 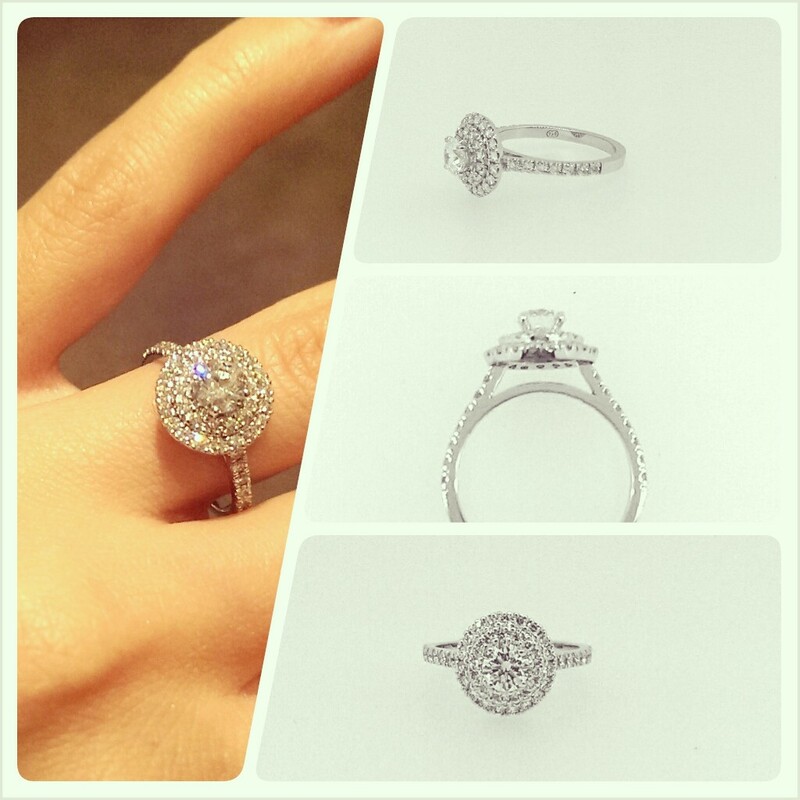 The 'halo' style is very popular as it is elegant and can enhance the size of the centre stone if designed well. Another popular style is diamond solitaire, where the diamond is set on it's own as the feature. Rest assured that the design process is always fun and we will help you create the perfect style for your lady love. Custom made ring with two tiered 'halo's' around claw set brilliant cut diamond. It's always best to have the finger properly sized, but most likely you won't want your bride- to- be to know of your plans of proposal so Cassandra will give you ideas on how to do this so she won't have a clue. Always consider the lifestyle of the wearer of the ring, occupation and daily environments will determine choice in style and metals. e.g. nurses or carers may prefer lower settings as they are less likely to catch and women who constantly handle abrasive papers in the office area might prefer platinum as this will out- wear gold many times over. Well, I certainly hoped this has helped you. Ladies feel free to share this post with your man. Fella's, we hope you feel more confident now and feel free to email with any questions. Did you learn anything new? We hope so.